Top: Turquoise charmeuse silk blouse top has been embellished with stunning crystals ornamental motifs around the neckline and rest of the blouse. Square neckline with thin embellished straps. Fitted cut. Fully lined. Hidden zipper at back. Saree: Royal blue and Amber gold crinkle chiffon jamawar Saree has stunning small and big sized round ornamental motifs on pallu made with Swarovski crystals and beading work. 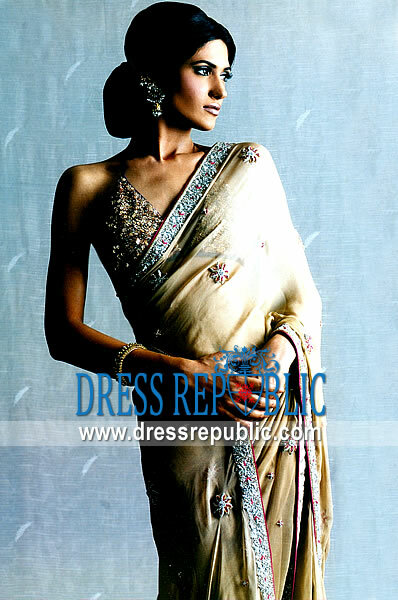 Pre-draped and stitched with belt for easy to wear. Petticoat included. Embellishments made with Swarovski crystals, diamantes, sequins, beads, kora, dabka, pearls and cut-glass. 100% natural pure fabrics. Fully handmade embellishments. 100% same as shown.